A Backwards Progress - Homestead Edition: CSA: Completely Super Awesome! I realized that I haven't really blogged yet about the goodness of my CSA basket! You might think my garden has been the source of most of my delicious veggies this summer, but the truth is far from it! I planted the garden with a few things not grown on the farm (edamame!) and some transplants leftover after farm planting that Our Little Farm has been kind enough to share with me. The bulk of our (JF and I) food supply this summer has been in the form of organic, just-harvested produce in the farm CSA basket. CSA stands for Community Supported Agriculture, and I would say it's one of the best ways local food supporters can vote with our dollars and encourage local, ethical farmers. Our weekly boxes have included old favorites like: tomatoes, broccoli, carrots, onions, lettuce, cabbage, kale and beets as well as new experiences that motivate us to get creative in the kitchen, such as: pak choi, rabiole, rainbow swiss chard and daikon. This summer, we've been eating a healthier more diverse diet, taking greater pleasure in cooking and eating and spending much less time shopping at the grocery store! 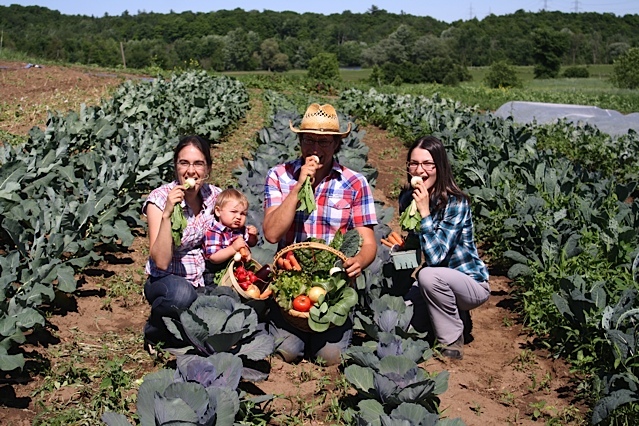 Our Little Farm has CSA box pick up points in Ottawa and Gatineau. If you are interested, you may want to contact them to put your name on their waiting list for next year!